Netanyahu arrives in the UK to discuss regional security cooperation with British Prime Minister Cameron after UK guarantees his diplomatic immunity as a visiting head of state. Prime Minister Benjamin Netanyahu and his wife Sara have arrived in London on Wednesday in order to hold talks aimed at strengthening security cooperation with British Prime Minister David Cameron. Europe should see Israel as a partner in confronting the "mediaevalism" of militant Islam rather than criticizing it for its policy towards the Palestinians, Netanyhu said before embarking on the trip. Speaking after meeting European Council President Donald Tusk and before flying to London for talks with David Cameron, Netanyahu said Israel, like Europe, was under threat from violent Islam and the two needed to stand together. "We're challenged by the opposite of modernity, which is a barbaric mediaevalism, early mediaevalism, primitive, savage, murderous, that comes from the two sources of militant Islam," he said, referring to Sunnis and Shi'ites. "Europe should support Israel - not pressure Israel, not attack Israel, but support Israel, which is the only real shield that Europe and the Middle East have against extremist Islam, which is surging," he told reporters. The prime minister went on to say,"We are prepared to act together with Europe in Africa and other places to fight extremist Islam but this requires a change of approach. This change will take time but we will implement it. This will be one focus of my talks with David Cameron." 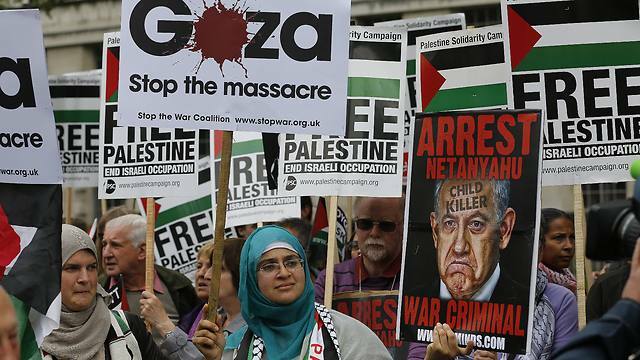 The trip did not go unchallenged by the numerous vocal pro-Palestinian groups in the UK, with some 300 demonstrators waving flags and "Free Palestine" banners during a noisy protest in central London against Netanyahu's visit. Minor scuffles with police broke out as they surged into the main road outside the Downing Street residence of the British premier, who will hold talks with Netanyahu on Thursday morning. Already 107,000 people in Britain have signed an online petition for Netanyahu's arrest after last year's fighting between Israel and Hamas in Gaza. "We're here because we feel that Netanyahu should pay for his war crimes," said 21-year-old student Marion Tehami. "We're here to protest and let him know that he's not welcome in our country." A short distance away in a separate cordoned off area, about 50 pro-Israel demonstrators waved the Israeli flag. Britain says visiting heads of state have immunity from legal process and thus cannot be arrested. In a statement, the government said on Tuesday: "We recognize that the conflict in Gaza last year took a terrible toll. "However the prime minister was clear on the UK's recognition of Israel's right to take proportionate action to defend itself, within the boundaries of international humanitarian law." Media and relations official in the Palestinian Forum in Britain Zaher Birawi said Netanyahu’s visit to Britain sends a message to Palestinians that Cameron’s government supports the terrorism of the Israeli occupation. Zaher Birawi said Israel is continuing its occupation of Palestinian territories and settlement construction in addition to the Separation Wall and aggressions on Gaza which all breach the international law. He underlined that Britain's support for Israel ruins the reputation of the country and enhances terrorism in the Middle East and the world. Birawi urged David Cameron’s government to stop supplying Israel with weapons and to oblige Netanyahu to stop settlement construction and Judaization procedures in Occupied Jerusalem as well as to end apartheid policy practices against Jerusalemite people. The Palestinian Forum in Britain organized a massive sit-in before the British government office in London in protest against the visit of Israeli Prime Minister Benjamin Netanyahu to Britain. It is expected that sit-inners will hand a letter of protest to the presidency of the government. 107,000 Britons signed a petition refusing Netanyahu’s visit to London on Wednesday, September 09, and demanding his arrest as a war criminal. In June 2011 I came to Britain to begin a speaking tour to draw attention to the plight of my people, the Palestinian citizens of Israel. The tour was meant to last 10 days. Instead I had to stay for 10 months in order to resist an attempt by the home secretary, Theresa May, to deport me – itself the result of a smear campaign against me and what I represent. I fought not just for my own sake, but for all who are smeared because they support the Palestinian cause. Since 1990 I have visited the UK several times to speak publicly. On this occasion I was arrested, imprisoned, and told I was to be deported to Israel because my presence in the UK was "not conducive to the public good". 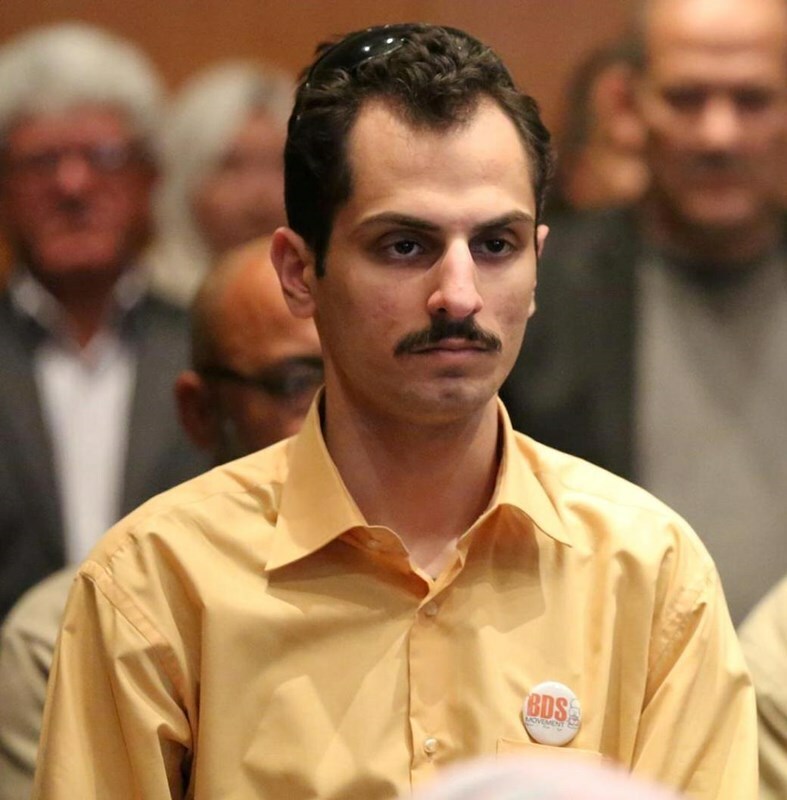 A judge later ruled that I had been illegally detained, but bail conditions continued to severely restrict my freedom, making it impossible for me to speak as I had intended. After a 10-month legal battle, I have now been cleared on "all grounds" by a senior immigration tribunal judge, who ruled that May's decision to deport me was "entirely unnecessary" and that she had been "misled". The evidence she relied on (which included a poem of mine which had been doctored to make it appear anti-Jewish) was not, he concluded, a fair portrayal of my views. In reality, I reject any and every form of racism, including antisemitism. I have no doubt that, despite this, Israel's cheerleaders in Britain will continue to smear my character. This is the price every Palestinian leader and campaigner is forced to pay. My people – the Palestinians – are the longstanding victims of Israeli racism. Victims of racism, anywhere, should never condone or support the maltreatment of another people, as Israel does. The suffering of the Palestinian citizens of Israel has been ignored for decades. But there is today a growing awareness of it, which partially explains this smear campaign against me. In December 2011, EU ambassadors in Israel raised serious concerns about Israeli discrimination, noting that "not only has the situation of the Palestinian Arab minority in Israel not improved, but it has further deteriorated". There are around 1.5 million Arabs in Israel. We make up 17% of the population, but we face a barrage of racist policies and discriminatory laws. We receive less than 5% of funds allocated by the government for development. Public spending on children in Arab municipalities is one-third lower than that of children in Jewish municipalities. The average hourly wage of Arab workers is about 70% of that of Jewish workers. Any Jew, from any country, is allowed under Israel's law of return to migrate to Israel; Palestinian refugees are not allowed to exercise their right of return. While a Jew can live anywhere in Israel, a Palestinian citizen cannot. Jews can marry whoever they wish and live with them in Israel, Palestinian citizens cannot. In the criminal justice system, a 2011 study commissioned by Israel's courts administration and Israel bar association revealed that almost half of Arabs receive custodial sentences for certain crimes, compared to a third of Jews. While 63.5% of Arabs convicted of violent crimes were sentenced to prison, only 43.7% of similar Jewish offenders were. Education is only one of several areas in which Palestinian citizens face discrimination in Israel. The Israeli government allocates less money per head for Arab children's education than it does for that of Jewish children. One devastating consequence is that the drop-out rate from schools is three times higher among Arabs than among Jews. Nowhere is the injustice more striking than in the Negev. Living in poverty in "unrecognised" villages, the Arab Bedouin are ineligible for basic services such as water, electricity, and healthcare. The Negev village of al-Araqib has been demolished 35 times by the Israeli government; on every occasion it was rebuilt by its inhabitants. Despite the Israeli policy of "transfer" – another term for ethnic cleansing – the Palestinians will not go away. The Israeli state can occupy our lands, demolish our homes, drill tunnels under the old city of Jerusalem – but we will not disappear. Instead, we now aspire to a directly elected leadership for Palestinians in Israel; one that would truly represent our interests. We seek only the legal rights guaranteed to us by international conventions and laws. The Palestinian issue can only be resolved if Israel and its supporters in Britain abandon the dogmas of supremacy and truly adhere to the universal values of justice and fairness. Britain has a special responsibility in this, because it is uniquely responsible for our suffering: our national tragedy began with the Balfour Declaration. While Britain enforced the first part of the declaration, which promised Palestine as a homeland for the Jewish people, but ignored the part that states: "It being clearly understood that nothing shall be done which may prejudice the civil and religious rights of existing non-Jewish communities in Palestine." If there is any lesson to be learned from this sordid affair, it is that there is nothing to gain from putting false words into my mouth, or casting me out of the mainstream of public discourse. 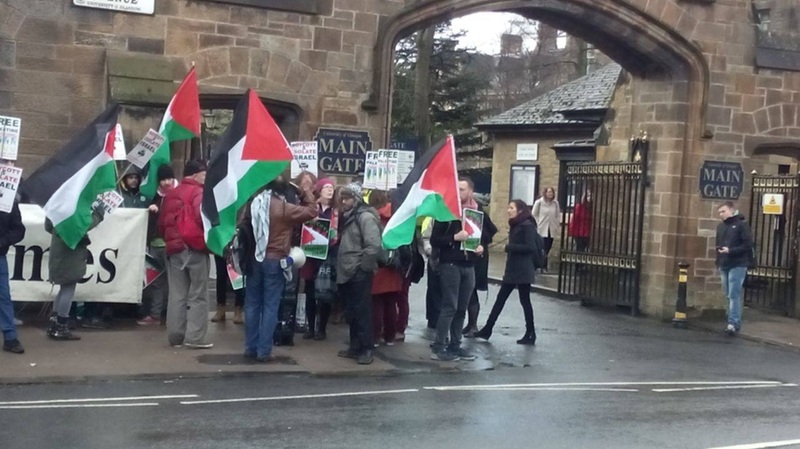 Palestinians in Scotland Condemn School Materials Labeling Them "Terrorists"
The Association of Palestinian Communities in Scotland today condemned inflammatory teaching materials given to young children in a North Lanarkshire school which seeks to demonise Palestinians. Children as young as 11 at New Stevenson Primary school, were given homework which described Palestine as Israel, and labelled all Palestinians seeking to end the occupation as "separatist terrorists". Pupils were asked if "Palestinians feel they have the RIGHT to use terrorism against the Israeli." "The "Separatists" case study given to children as homework demonstrates a fundamentally flawed reading of history and geography, flying in the face of countless UN resolutions and shows an ignorance which beggars belief. No one other than the State of Israel regards the Occupied Palestinian Territories as forming part of Israel, and no one regards the struggle of the Palestinian people as a separatist struggle. The United Nations consistently supports the right of the Palestinian people to self determination and governments across the world including the UK and Scottish governments call for the end to the occupation. In July and August of last year, more than 500 Palestinian children were killed by the Israeli Occupation Forces and schools were razed to the ground by bombing raids and missile attacks. Unlike the children of Israeli settlers, Palestinian children are subject to military law. This means they can be detained without the knowledge of their parents, detained and held in adult prisons without charge and appear before military courts. Children in North Lanarkshire should be not be taught to demonise Palestinians, they should be learning how children of the same age are beaten and shot by Israeli soldiers. We are calling for the immediate withdrawal of all such materials from Scottish schools, a public apology to the Palestinian community in Scotland and a meeting with education department officials in North Lanarkshire with the leader of the council and Scotland's Minister for Education. We ask that all materials used in schools relating to the teaching of the history of Palestine is discussed between Education Scotland and the Palestinian community. At a time when Muslims are being demonised for the actions of a tiny minority, our children need to gain a proper understanding of the occupation of Palestine and learn compassion and not fear and hatred."